A couple of weeks ago I posted ensaladang mangga and it seems that there is one ingredient that people might have hard time looking for which is the bagoong. So if you tried to search for it in Asian Shops or even Filipino Shops and did not manage to find one then the best that I can do is give you a new recipe which does not use bagoong but still uses mango as its main ingredient, let me present to you the fresh mango chutney. Chutney is a Hindi word which means pasty sauce, this type of dish is usually made out of a mixture of different spices, fruits and/or vegetables mixed together and served as a side dish to complement main dishes. Generally it can be prepared in many ways wet or dry, fresh or pickled, coarse or smooth texture. Chutneys had existed since the 17th century and in fact these were packed and imported to European countries like England and France from India, then European imitations became popular as they made it to suit the Western taste buds. These European version chutneys are fruitier than spicy if compared to the Indian counterparts, where fruits together with vinegar and sugar are cooked and reduced. It later on became a British tradition and passed on to its colonies that’s why you see remnants of this tradition in the Caribbean and South America where until now chutneys are a popular condiment for most of their dishes. For this recipe we will not be cooking it or making some sort of paste but rather create an easy to prepare fresh mango chutney that will go best with meaty dishes. This is awesome. Brings back memories of eating raw mangoes with salt and chilli! 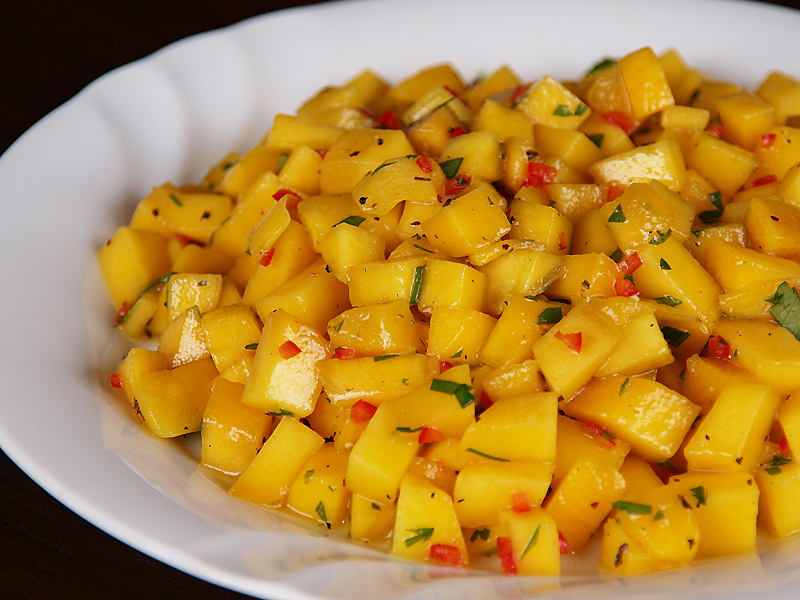 This is probably the best recipe for mango chutney that I have seen. Superb! a great appetizer, will be a hit at home although my mango chutney is more spicier with curry powder and spices. Fresh and colorful, a complement to a any meal. droooool! I love the mint added in, I’ve never used that before! I love chutneys especially with flavored rice and this mango one looks lovely! OMG, I got so hungry now! This looks great. We always put chili or masala and a little sea salt on fruits. I love the sweet and spicy combination. YUMMY! I like your addition of fresh mint in the recipe!